I may need to stop saying “Winter is here” at the start of every blog post, but I can’t help it! To help you chase away the wintery blues this season, The Boy and I thought we would share a heart warming meal which you can have right next to the heater or fireplace. This is a dish that makes me think of home. Odd that a hot and humid weather climate country should have a dish such as this, heck we come from the land of spices, curries, chillies and hot soups! 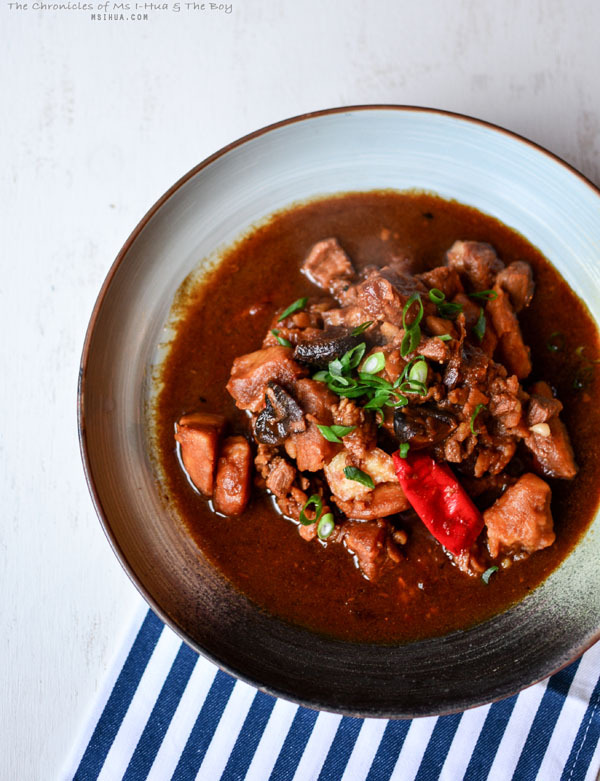 Here’s one to warm your bones and stop your shivering, an all-time Malaysian Nyonya favourite, Babi Pongteh 🙂 This however is a slightly inauthentic version due to the lack of ingredients in this country. Growing up, this was one of the dishes which I always bugged my Po Po (grandma) to cook for me. That lady knew how to cook! She would make me anything I asked of her. Curry Chicken, Lobak, Durian with Glutinous Rice. You name it, she would cook it. Gosh, I miss her so! Heat oil in a wok and sauté garlic, shallots and soy bean paste until fragrant. Slowly add in a few pieces of the pork to brown. Once the pork starts to turn a lovely golden brown colour, add red chilli and dried Chinese mushrooms. Add just enough water to immerse half of the pork. Bring to boil and turn the heat down to simmer until the pork is tender. Add the potatoes into the simmering pot after 30 minutes and simmer on low heat until the pork is tender and the potatoes cooked. Season with palm sugar, ground white pepper and thick dark soy sauce to taste. Garnish with spring onions and serve hot with steamed white rice. So what are you waiting for? Get a bottle of fermented soy beans and as much pork belly you can muster and start braisin’! 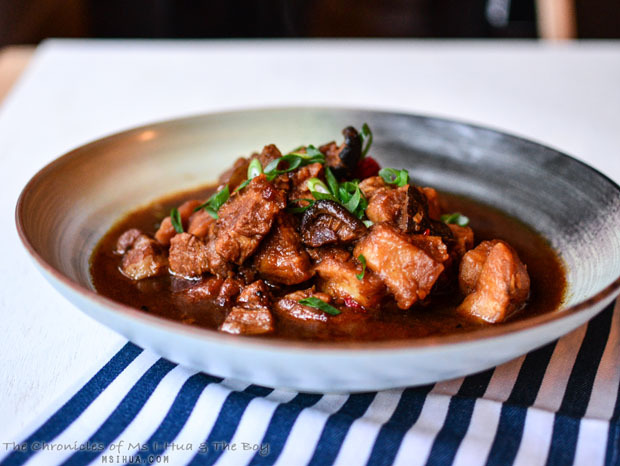 Spicy, sweet and tender pork works for me! Slow cooking during winter demands for great recipes, such as this. So, thanks for sharing! Anything with pork works for me! This is definitely the perfect dish for winter- yummo! It’s good and almost gluten free? Love love love pong teh! Glad you made it too… babi version! The use of gula melaka sounds like an idea, maybe I’ll try that next time. The gula melaka makes it more caramelly and savoury all at once! This looks so appetising and perfect for this cold weather. 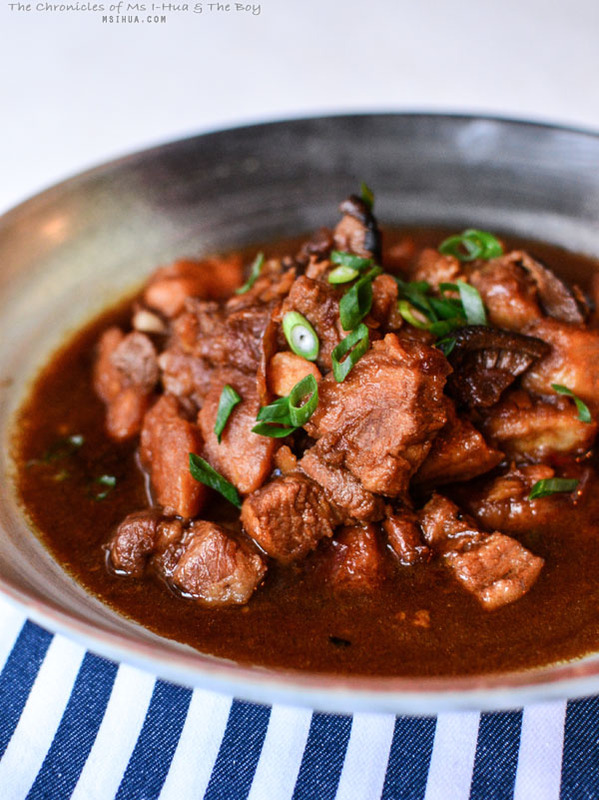 I love the combination of pork and shitake mushrooms in this dish, and the sauce looks delicious! I miss my gran too, she made the best roasts and cakes. I’m in HK now so it’s SUPER duper hot but i know once I land back in melbourne I’ll miss the heat because I heard Melbourne is super cold and raining heaps lately! I’ve never heard of this dish before but seems perfect for the weather so comforting! Pongteh of any kind makes me happy! Loved your Babi pong teh recipe…have you also got recipe for itek sio?